Students in the Youth Empowerment Institute show their work to the president. “Was there ever a time when you were underestimated?” a Gilroy High School sophomore asked Janet Napolitano, president of the University of California. During a two-day visit to campus, UC President Janet Napolitano gets a tour of the UC Santa Cruz Farm from professor Daniel Press, executive director of the Center for Agroecology and Sustainable Food Systems. The student’s question came on day two of Napolitano’s visit to UC Santa Cruz. She was meeting with 11 girls, ages 13 to 17, who are taking part in the weeklong Youth Empowerment Institute (YEI), an annual summer camp for girls organized by the campus’s Everett Program that merges college access topics with emerging technology. Napolitano arrived on campus Monday afternoon and visited the Dickens Universe and the UC Santa Cruz Farm. She also took part in a reception for local elected officials at the Farm, followed by dinner with campus guests at the Cowell Ranch Hay Barn. After a tour of the Farm with Daniel Press, executive director of the Center for Agroecology and Sustainable Food Systems, Napolitano noted how the UC Santa Cruz Farm and Garden, now approaching its 50th anniversary, has been ahead of its time in teaching skills in organic and sustainable agriculture. 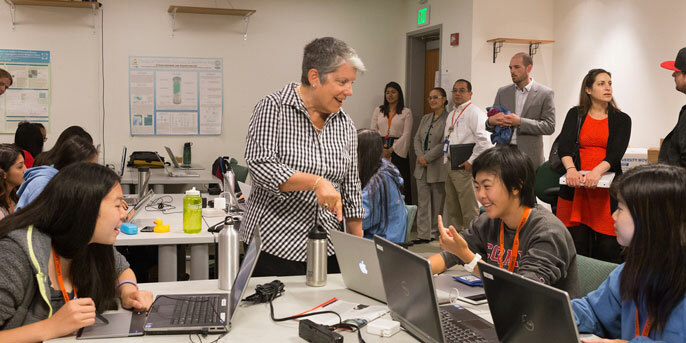 On Tuesday morning, Napolitano stopped by the Game Design and the Robotics and Networks clusters of the California State Summer School for Mathematics and Science (COSMOS) before visiting YEI. Napolitano talks with girls in the Youth Empowerment Institute with professor Chris Benner, executive director of the Everett Program. The girls have been working this week on updating YEI College Mentor, a mobile app first created by participants in the 2014 class. The goal of the program is to equip girls with two sets of skills, said Thomas Gelder (College Ten, ‘13, sociology), technology manger for the Everett Program. First, he said, is the knowledge to pursue a college education, and second, are the digital skills needed to share that knowledge with other students. Over five days, students will learn to code the app that serves as a digital college counselor. Napolitano told the group that being underestimated means you have to “work really hard, master the material–never go into a meeting unprepared–and seek advice.” You don’t always have to take the advice, she told the group, but it’s important to listen. The Everett Program is named for Dorothy E. Everett, a longtime UC staffer who became the university’s assistant president. UC Santa Cruz alumnus Mark Headley, who serves as the program’s co-chair, selected the name when he helped endow the Dorothy E. Everett Global Information and Social Entrepreneurship Chair. Formerly known as the Global Information Internship Program, the program harnesses the creativity and passion of young people to make a difference in the world by using information and communications technology and teaching others how to use it. In her meeting with YEI participants, Napolitano described her undergraduate liberal arts curriculum at Santa Clara University after initially being a music major. Monday, during her visit to the Dickens Universe 2016, she talked about why intellectual activities such as the Dickens program are important to public research universities and read a quote from Mr. Morfin, a character in Dombey and Son, the focus of this year’s gathering. “The process he describes—of looking at familiar people and places through new and distant points of view, and of being shaken in our habits—is the process we each experience when we read a transformative novel, when we see a timeless painting, or when we listen to a powerful symphony,” Napolitano said. “It’s the process that, fundamentally, makes us human. “At the University of California, the humanities are a cornerstone of our world-renowned research and education missions," she said. The Dickens Universe—and the Dickens Project—play an important role in UC’s mission to ensure the transmission of cultural heritage from one generation to the next; to broaden our understanding of the human experience; and to foster our intellectual curiosity and our empathy as members of a diverse and democratic society, Napolitano said. Tuesday, at COSMOS, high school students showed Napolitano the robots—called “cockroaches”—that they are programming to avoid light, hide in the dark, and not get stuck. Students in the California State Summer School for Mathematics and Science (COSMOS) explain their projects to the UC president. COSMOS is an intensive four-week residential camp that prepares high school students for careers in the fields of science, technology, engineering, and mathematics. About 170 high school students from throughout the state enrolled in the program at UC Santa Cruz this summer. The students are writing code in the programming language C and installing it on the robots for testing, explained computer engineering professor Gabriel Elkaim. The training began with students learning about simple coding commands before using the light and bump sensors on the robots. The hands-on approach gives students an opportunity to debug their own work. The critical thinking skills they acquire will be helpful in an array of fields beyond computer programming. Computer engineering professor Tracy Larrabee said the projects offer a tangible and testable example for the abstract reasoning that underlies computer code. “Coding is almost like a physical skill, like riding a bike. It’s visceral,” Larrabee said. Who is Dorothy E. Everett?